Oscar Cruz, president and CEO of Families In Schools, with parents at Wednesday’s news conference outside City Hall. While tens of thousands of Los Angeles educators and families on Wednesday celebrated the end of the six-day teacher strike, about a dozen parents held their own news conference outside City Hall to make sure their voices were heard too. Wearing white to signify neutrality, they said they felt that parents, particularly those in high-needs schools, were sidelined during the negotiations and the strike. Now that the teachers contract is settled, they want to make sure they are included in the local decision-making at their schools. They want to advocate for more school funding and be able to give input on how it’s spent. They hope they don’t have to experience another strike, but if there’s another protracted disagreement between the teachers union and the district that so significantly impacts their children’s education, they want their voices to be represented at the table. “We are here, parents from traditional district schools, charters and other public schools, to say that we are independent, that we want to be included in the conversation between the two institutions that decided to be on strike and didn’t pay attention to us,” Ana Carreón said in Spanish to the small circle of journalists and television cameras that numbered nearly as many as the parents. “Some of us felt intimidated during the strike to support one side or the other, and that was not fair. We’re now grateful for both parties that they ended it, but we want parents to be included in future negotiations. This is not the end, this is just the beginning,” said Carreón, mother of a senior at Foshay Learning Center near downtown. L.A. Unified serves nearly half a million students, 82 percent of whom live in poverty. More than 17,000 experience homelessness. It’s estimated that 1 in 4 students has a parent who is an undocumented immigrant. And nearly half are or have been English learners, so they don’t have access to the more rigorous courses that are required for access to the state’s public universities. The parents said they were grateful for the leadership of L.A. Unified and United Teachers Los Angeles as well as Mayor Eric Garcetti for reaching an agreement so educators could return to their classrooms. They also said that during the last 10 days of negotiations they felt “largely ignored” and they now want to collaborate with both parties to ease the impact of the strike’s aftermath for the most vulnerable students in the district. “The last 10 days were very difficult for all district families. 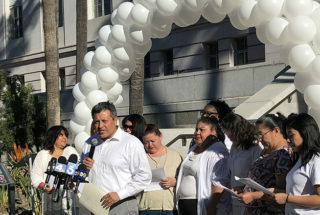 They felt forced to choose sides, they felt left out of the conversation, and most importantly, they felt concerned about the impact that the strike would have on their child’s education,” said Oscar Cruz, president and CEO of Families In Schools, an L.A.-based parent advocacy nonprofit that serves about 5,000 L.A. families a year and helped the parents organize Wednesday’s news conference. Cruz told LA School Report that because of the strike, people from his organization who assist parents and seniors with their college applications were not able to provide that help. “We provide that service to families at school sites, so because of the strike our staff had to be away from schools last week. So more than 100 high school families missed about an hour of college counseling and mentorship. That’s 100 hours of service that got lost,” Cruz said. During the six days of the strike, L.A. Unified reported a gross revenue loss of about $150 million from sharply lower attendance. “Definitely the strike had a cost. I guess the good news came when the governor announced his new budget and there’s more money than we were expecting. But at the same time we lost all this money,” said Kathy Kantner, an L.A. Unified parent who spoke Wednesday and sits on a district parent committee. “There’s also a lot of concern about the loss of instruction, and that’s a cost as well,” Kantner said. “We ask state and local leaders to commit more investments in our public schools. Particularly, we urge the teachers union and the district to include us in the decision-making process that impacts those investments that affect our children’s academic achievement. We can be active participants in our children’s education. We don’t want to be sidelined, we want to be part of the action,” Maria León, a parent from East Los Angeles, said in Spanish. Mayra Pacheco said she was there to speak on behalf of charter school parents. Her three children attend Vaughn Next Century Learning Center, a charter school in Pacoima in the east San Fernando Valley. She said one of her main concerns now is that she heard the new agreement would limit options for other parents like her who are just looking for a better school option. Just 42 percent of L.A. Unified students met reading standards this year on this year’s state tests, and 32 percent met math standards. Among Latinos, who make up three-quarters of district enrollment, 36 percent met English standards and 25 percent met math standards. English learners were the student group with the lowest proficiency rate: 96 percent didn’t meet reading standards, and 95 percent didn’t meet math standards. Hilda Ávila, whose son attends Fries Avenue Elementary in Wilmington in south Los Angeles, said she didn’t send her son to school during the strike because she supported teachers on the picket lines, but she came to Wednesday’s news conference to give voice to low-income immigrant parents who had to send their kids to school and had to face hostility even from other parents. “We need to understand each other’s stories and get to know the reasons why they had no other choice. Now it’s time to move away from our differences and collaborate. It’s time to be very involved and advocate together for more funding for our schools and avoid another strike happening again,” Ávila said in Spanish. “As educators and students go back to schools, parents want to be heard by the Los Angeles educational community,” Cruz said.